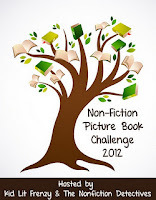 We have partnered with Kid Lit Frenzy to encourage readers to read more nonfiction picture books this year. As a child growing up in a small New England town, I was raised to love the Red Sox. I have fond memories of watching players like Jim Rice and Carl Yastrzemski take the field at Fenway Park in the late 1970s. Ted Williams had been retired for many years by that time, but he still remained in the hearts and minds of baseball fans. I've been eagerly anticipating the release of Matt Tavares' latest picture book about Ted Williams. Part of my excitement comes from my own passion for baseball, but I also know this book will be extremely popular with the readers in my library. Matt Tavares traces the rise of hitting sensation Ted Willams from a skinny boy growing up in the 1920s to one of baseball's greatest batters of all time. As a lanky teenager, Ted Williams was drafted by the New York Yankees, but he turned down the contract to play minor league baseball near his home in southern California. Eventually Williams went on to play for the Boston Red Sox. Williams had great success in the major leagues and closed the 1941 season with a .406 batting average. This picture book biography with wide margins and short lines reads like free verse poetry. Tavares provides readers with highlights from Williams' career while capturing the excitement and emotion of the game. all the way to home plate. There Goes Ted Williams is more than just a sports story. During Williams' career, he left baseball to serve as a pilot in World War II and the Korean War. During the Korean War, Williams made a tough decision to eject from his malfunctioning plane even though he could break both legs and end his baseball career. Williams walked away from the crash and returned to baseball several months later. In the tradition of Mudball and Henry Aaron's Dream, Tavares' illustrations are detailed and full of life- the creases in the uniform, the shadow formed by the brim of the hat, the stitches on the baseball. The watercolor, gouache and pencil illustrations eloquently capture Williams' stance and facial expressions. In one intense scene, Williams is pictured in the foreground running away from a burning fighter jet. This is sure to capture the attention of even the most reluctant readers. A list of Williams' stats by year and a bibliography are located in the back of the book. 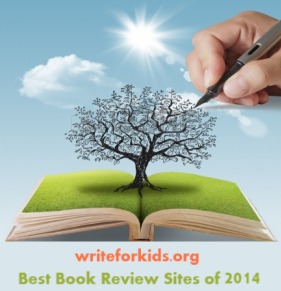 In an author's note, Tavares reveals that Williams was not perfect. He had a bad temper, he swore, and he had a tumultuous relationship with the media. Despite these flaws, the author set out to tell the story of a man who was one of the greatest hitters of all time and also served his country well. "The story of Ted Williams is the story of an American hero." Young baseball fans will scoop up this book; it would also make an inspiring story for an adult to share with a child. Pair this book with The Unforgettable Season: Joe DiMaggio, Ted Williams, and the Record-Setting Summer of 1941 by Phil Bildner. 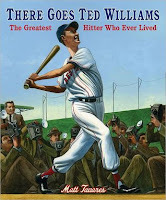 Candlewick Press is giving away a copy of There Goes Ted Williams. Entries will be accepted from 9 p.m. on Sunday, February 12, 2012 until 12:00 a.m. on Friday, February 17, 2012. I'll have to take a look at this one. I have about ten boys who will ONLY read baseball books, so I am always looking for things that will keep them happy. I loved Tavares bio on Henry Aaron so I can't wait to read this one.